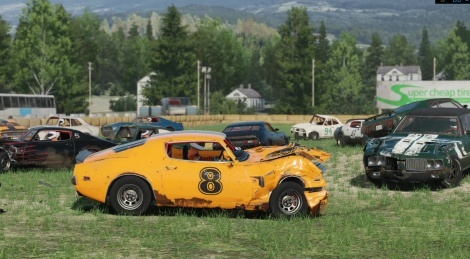 It's been more than a year since we last showed you Wreckfest (aka Next Car Game by the developers of the Flatout series) so since the game just got a new big update, we thought you'd be interested to see how far they have come. The game now runs perfectly well on our setup, even when fully maxed out, which wasn't the case a few months ago. There is still work to be done obviously, to finish the newly added tracks (Sandpit #1 and Tarmac #2 have placeholders as you'll see), to add animations to the pilot and to make menu navigation more practical with a gamepad, but they're definitely going in the right direction. On top of that, Bugbear announced the upcoming addition of real tracks to complete the current list of available locations. • Physics improvements, more realistic geometry dynamics. •Implemented joint-based steering rack implementation. • Improved visual damage accuracy and realism, cars now deform more like they're made of sheet metal instead of paper or plastic. • Implemented ambient occlusion maps for vehicles. • Resurrected ambient shadow for vehicles, now affected by visual damage. • Resurrected low frequency ambient occlusion for scenes. • Running Steam client is no longer needed for dedicated servers. • Again reduced dedicated server CPU load on empty servers. • Improved tire adhesion audio, now reacts to different tyre conditions. • Implemented basic anti-hacking measures: The game now detects in case there are modified or additional files in sensitive data folders, excluding art. In case modded content is is detected leaderboards are disabled. Multiplayer requires that the server and clients have the same modified files. • Added a new game mode: Sprint Cup, consisting of 3 heats of 2 lap races. • Added basic part durability mechanic: parts now wear with use, lowering performance. • AI opponents are now picked based on player's car class. • Added a set of new AI opponents with different cars. • Enabled ABS & TCS helpers in multiplayer. • Fixed team race lap position points awarding. • Improve lost tire and damage tracking in replay. • Implemented a new (placeholder) upgrading menu. • Added a whole host of new vehicle parts. • Implemented a placeholder marketplace. • Added an alert when a multiplayer event is about to start. • Implemented more accurate option sliders when using a controller. • Added a new race track: Mixed 1. • Added a new race track: Tarmac 2. • Added a new derby track: Lawn Mower Derby. • Improved replay cameras on all tracks. • Improved AI behaviour on all tracks. • Added a new vehicle: Lawn Mower with rag doll driver. • Game should no longer crash while chatting in spectate mode. • Reduced and unified vehicle part wear rates across the board. • European 1 is now less prone to rolling over. • Added proper material to Mixed 1 arm-cos.
• Fixed various graphical glitches on Tarmac 2. • Resurrected backfire effect (American 2 pending). IMPORTANT NOTE: To prevent glitches and ensure full compatibility all user save data and settings was reset. For compensation everyone now gets 5000 credits when starting the career. I´m really surprised by the graphics. Amazing! This looks amazing but I dread to think how poor it's going to run on my PS4. Damn that looks good! So jealous of pc owners right now! Had huge amounts of fun with DD back in the day..
Would love if they have optimized the game more, was a slideshow for me last time i tried it. wow those graphics look amazing. i think the dust and smoke is needed to be a little better but wow. wasnt sure if i was watching game or tv at times. Looks nice. I hope they intend to put in the mini-games from flatout. They were the only good thing about the old games. 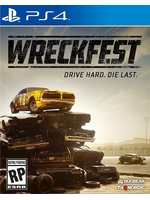 I have this game more then a year aswell, bought into the early-access thing.. Destruction derby is bassicly all I do in this game with some friends just for a laugh.. It's a fun game, but I really wish Bugbear was working on it a bit more (I guess they still miss the resources), especially with more content in cars and tracks etc..